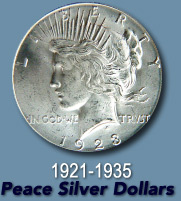 ON TWO OF THE WORLD'S MOST POPULAR COINS! We can provide any quantity you desire for for all grades listed, up to 1,000 of each! Dates & Mints are of our choice, but the more you buy, the more better dates and grades we will include. Dealers order these from us time and time again. We know they are happy repeat customers and we want you to be a repeat customer too! For superior (designated by a "+"). 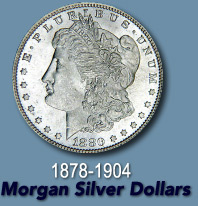 hand-selected-for-great-eye-appeal ACCGS "slabbed" BU 65 and better silver dollars, add 20% to the prices below. © 1995-2014 by CollectorsInternet.com. All material at this site is copyrighted by CollectorsInternet and may not be reprinted in whole or in part, or stored, or transmitted by any means, including electronic. All commercial use, transmission and reproduction of this site is strictly prohibited by national and international laws.